Every year over 3 million Americans try to quit smoking, but only half of them succeed. With the help of Acupuncture, you have a greater chance of success! Most experts agree that quitting smoking is the single most important thing that you can do for your health. More than 25 diseases are associated with tobacco use, including cancer of the lungs, bladder, mouth, larynx, pharynx, esophagus, pancreas, kidney, uterus, and cervix. Smoking also raises the chances of developing emphysema and increases the risk of having a stroke by 30 percent. There is plenty of incentive to quit, but it isn't easy. The good new is that acupuncture has helped millions of people to kick the smoking habit. How acupuncture can help. Some of the largest stumbling blocks to becoming smoke free are the stress, anxiety, and depression associated with quitting. Fortunately, acupuncture treatments are quite successful at calming and relaxing the mind, reducing anxiety, and alleviating depressive feelings. Specific acupoints in the ear and wrist are used to accomplish this. Additional acupoints may be included to help suppress your appetite, stimulate repair and healing of organ systems, and reduce food and nicotine cravings. 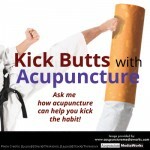 More than just kicking the habit, using acupuncture to quit smoking yields enormous benefits. Aside from taking care of the stumbling blocks, that can cause you to resume the habit, acupuncture can help restore your body to a healthy state of balance and well-being. If you are ready to become smoke-free, acupuncture can help provide you with the support you need. It is no secret that smoking cigarettes has a negative impact on your health, and the health of those around you. The message that smoking is bad for you is not a new one, but because we have heard it for so long, it is easy for us to ignore. This message doesn't even phase the more than 45 million smokers who light up every day. We have all heard that cigarette smoke will lead to deteriorating health, decreased lung capacity, emphysema, and cardiovascular problems. These health problems, that most people do not notice until it is too late, are not the only problems caused b y smoking. There are a number of other side effects that we often overlook. Have you ever considered the impact that smoking cigarettes has on the rest of your body? Smoking cigarettes actually has a huge impact on the brain's neurotransmitter, dopamine. Dopamine is one of the chemicals in the brain that elevates pleasure and makes you feel good. But while nicotine in cigarettes is making you feel good, other chemicals in cigarettes, including carbon monoxide, are affecting your brain capacity. Smoking may soothe your stress, but you are essentially damaging motor- skills and short-term memory. Of course, our brain isn't the only part of our body that we overlook when we consider the negative impact of smoking. Smoking also harms your skin, by decreasing blood supply and lowering levels of vitamin A. Smoking stains your teeth and encourages periodontal disease. Couples who smoke have decreased fertility. Smoking has also been linked to cancer in the bladder, esophagus, kidneys, pancreas, and cervix. Neck pain sufferers reported increased satisfaction with chiropractic care over medication, according to a recent study. In the study, researchers assessed patient satisfaction scores in those suffering from acute and subacute neck pain. Methods of care included chiropractic care, specifically spinal manipulation, home exercise and advice care, and prescription medication. While both chiropractic care and home exercise and advice care were associated with more satisfaction with the information provided versus medication, individuals receiving chiropractic care were the most satisfied with their general care received compared to the two other groups. If youre suffering from neck pain and need some satisfaction, call your local doctor of chiropractic today for a no obligation evaluation! Source: JMPT. Volume 37, Issue 8, Pages 593601, October 2014. Colon and rectal cancers are increasing among younger adults, according to new research. At the same time, incidents of colon and rectal cancers in those over 50 years of age have been decreasing slightly. Researchers arent sure why rates are increasing among young adults, but attribute the decrease in those older adults to the increase in screening and removal of suspicious growths before theyre able to turn malignant. Should things continue on their current path, researchers believe colon and rectal cancer cases in those aged 20 to 34 years could come close to doubling in the next 15 years. For 35 to 49 year olds, those rates could increase by 28 to 46 percent.